Pets Costs > How Much Does a Parrotlet Cost? How Much Does a Parrotlet Cost? Known as one of the friendliest, smallest and most lovable birds on the market, parrotlets, known for its brilliant colors, are miniature in size and are known for their vibrant colors. Even though they are small, don’t be fooled as they can still outsmart and be just as intelligent as their bigger cousins, the parrot. BirdsNow.com, a popular birds-only classified website online, had about 200 active listings at the time of this publishing, with prices in the $100 to $300 range. BirdBreeders.com, another website similar to BirdsNow.com, had about 100 listings, with the average cost ranging from $100 to $350. Occasionally, if you are able to find a parrotlet at a big box retailer, such as Petco, they will often sell for $300 to $400. Blue – Native to the South America region, the blue male parrotlet is known for its blue stripes on the upper and under part of the wing, with no streaks around the eyes, while the female is completely opposite of this. Blue Fallow – Found in North America, the blue fallow has a dull green body, an apple-like green mask color and small blue streaks near the eye. The females will look similar, but their colors will appear duller and you won’t find the blue streaks near the eye. Out of all parrotlets, this species tends to have the largest personality that can be compared to that of a parrot. Green Rump – Also native to the South American region, the green rump is one of the smallest in the parrotlet species. The male has a bright emerald-green like body, with the wings displaying a nice shade of blue. The female, on the other hand, will have a complete green body with a yellowish tinge on her forehead, with the beak and feet pink in color. Even though most parrotlets are active and chirpy in nature, the green rump species tend to be more reserved. Lutino – The largest of all parrotlet species, the lutino, turquoise in color, can be found in the western parts of Mexico. These birds are becoming more endangered, so it will be much harder to find them being sold on the market. With that being said, the males are dark green in color, with a smidge of turquoise streaks on its wings, while the females display a completely green body with yellow-green markings on its wing instead blue. Sclater’s – Found in Brazil, the males have a deep green color with a violet ting on the lower back and rump, while the female will be lighter in color. These birds are rare on the market. Spectacled/Pied – Well liked by newbie parrot owners, this relatively new parrotlet species was imported from Europe. Deep green in color with a vibrant violet-blue stripe and a distinctive bright ring around the eye, they can learn quite a few words and are considered to be very active. Yellow – One of the largest parrotlets for sale, this species has a brilliant yellow body with a green underside, while the males will have a pinch more gray near the top, with a bright blue on the wings and lower back. The yellow parrotlet also tends to be reserved and won’t call for much in terms of love and touching. Try to set up the largest cage as possible, allowing the bird to fly comfortably from one side to the next, in a room away from the direct sunlight and one that is frequently attended such as a living room against a wall if possible. Inside the cage should be a variety of toys and perches of all sizes to keep the bird mentally stimulated. 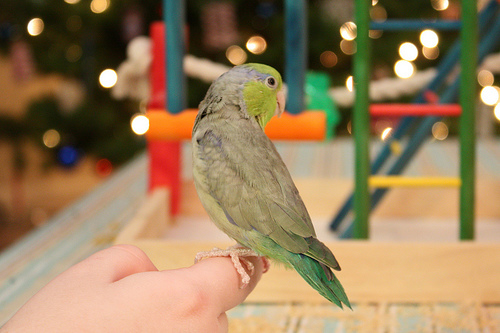 While they can do great as an indoor pet, some owners allow their parrotlet to fly and/or walk around the home when bored. LaurasLittleParrots.com recommends a cage of about 18″ x 18″ and larger. The cage, including the metal grate, food bowl and water bowl, should be cleaned at least once a week to guarantee your bird’s health and safety. When cleaning the cage, be sure to clean the bars in detail, the perches, toys and any accessories. If any of these items are looking worn, then it’s best to replace them with a new set. Some owners, while optional, will purchase a travel crate in order to safely transport their bird while on the road. As with most captive birds, avoid feeding your bird any food that isn’t designed for its system, including avocados, fruit seeds, peanuts, sugar, chocolate or anything fatty in nature. All of these items, even in low qualities, can cause serious health concerns for your pet. Clean distilled water should be available at all times and should be changed twice a day. Pint in size, these birds range anywhere from four to six inches in size, characterized by a stock body and short-like tail. They are the smallest parrots in the world. Due to their small size, they tend to be much quieter than their cousins, which makes them an ideal choice for an apartment-like setting. They can learn and mimic certain words with training, but they will not be considered the “best talkers” of the animal kingdom.